I used to be a Christmas tree Nazi. I really did. 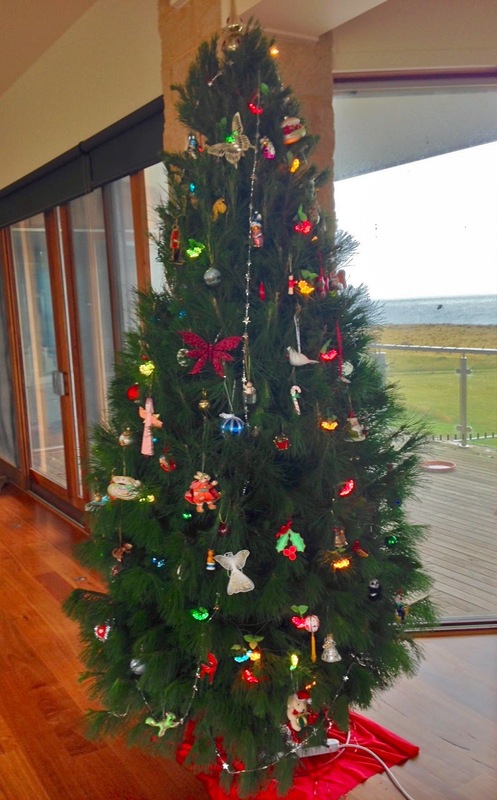 When Number 1 son was just a little bloke, I would climb the step-stool to hang the lights and then he would cheerfully loop all his favourite ornaments around the branches he could reach. The lower branches would be a festive cacophony, while the top remained tastefully minimal. There would be mutual congratulation and plentiful admiration. And then, as soon as he was in bed, I would begin to rearrange, relocate and reduce. Every year. Without fail. On the first Saturday of December. Today, when Dr Dad and I went down to select the tree from the local farm, Mr 16 didn't want to come. He can't cope with watching the ceremonial chopping down of the tree. It makes his heart ache to think that this glorious green-scented beauty must sacrifice four years of development for our Yule-time pleasure. He can't watch. So when I finally collected the dusty boxes marked 'Super Fragile' from the shed, it was only child number three, Girlchild — Miss 14, who was keen to be part of the annual decorating ritual. Like me, she revels in the rediscovery of the treasures that have been boxed away all year. But she's not systematic or ordered about it. She bounced joyfully between the boxes and the tree, leaving a trail of bubble-wrap in her wake, singing as she went or chatting incessantly over the soundtrack of the cheesy Christmas movie I had chosen. I just sat and watched. Number one son is already 31 years old and long gone. Mr 16 is a planet who spins in his own solar system. My baby girl is already a teenager. I didn't want to do anything to break the spell. Finally, as she appraised her handiwork, she expressed how glad that she feels that we don't have one of those catalogue trees made of plastic. Or worse, one like the silver tinsel and wire thing that Grandma has because pine needles make too much mess. Or a perfectly co-ordinated affair, each year a different matching pair of colours: red and gold, green and silver, pink and blue. Like a department store. I always admire those glamorous creations; they're so thoughtfully designed and perfectly balanced. But I too love our mismatched tree. It speaks of my life. 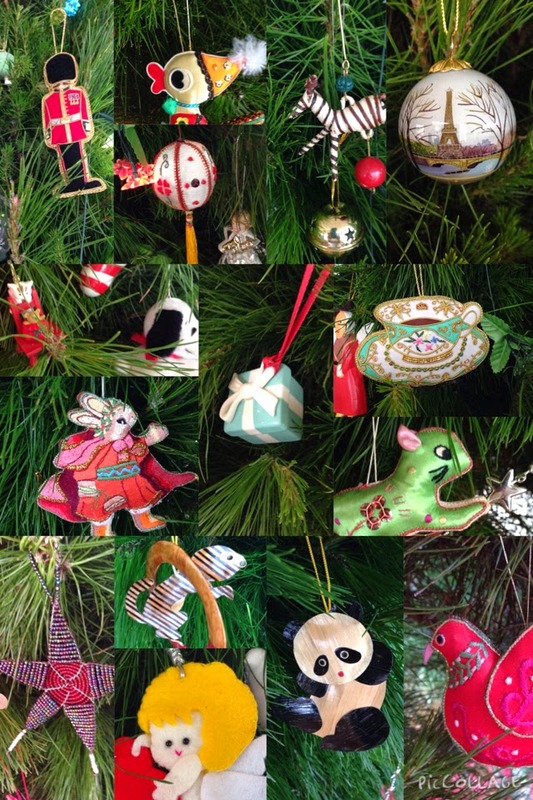 Whenever I have travelled, since my first overseas trip, I have collected ornaments for the tree. A Tiffany's box from New York, pandas from China, an embroidered royal tea cup from London, Pinocchio from Milan, satin balls from Beijing, beaded beauties from East Africa, silk animals from Malaysia and Korea, hand-painted balls from Paris and Washington, angels from Indonesia. Every one of them tells its own story. Then there are all the gifts I have received over the years. Irreplaceable hand-made jewels, delicate glass baubles that belie the enduring strength of true friendship, and lovingly chosen ornaments that reflect how well others know me... like the frankfurt Karin brought me from Germany. Impossible not to smile. So this year I think I should apologise to Number 1 son for all those years of insulting his aesthetics. It really would have been magic if all three of them had been here to trim the tree together. Please tell the lovely girl child that H and L search every year for her little Christmas Fairy/Angel to put on top of the tree before any other decorations go up. You have trained them well. Lovely piece and great pics. I feel the same about my ornaments - they all tell a story. I will post pics when my tree goes up which isn't until around the 23rd of December. I"ll look forward to seeing what I'm sure are some stunning decorations, Mary Anne, and reading your beautiful accompanying text. You write so well. I didn't photograph my VERY favourite... a nativity scene of little corn dolls I bought in Kenya. Made at a local church to raise money for the orphanage. Baby Jesus is like a tiny swaddled black tadpole. Would you like me to post a pic? What a lovely story! Our tree is pretty much a jumble too, including "Creepy Santa," a strange little hand-stitched mailbox, and paper angels with pipe-cleaner wings, made by our daughter in kindergarten. Now I'm really looking forward to getting into that box of memories! Thank you, Karen. Our version of your Creepy Santa would be Scary Clown ... my daughter wouldn't let me photograph it. I'm so glad that my post resonated with you. I was obsessive about the tree for years...not so much in making sure it was perfect, but making sure that every spot was completely filled...it was awe inspiring and slightly insane. I stopped last year and just have a little table top tree. That I cram full of ornaments. I can't help myself.